B: Huh? What am I supposed to cut? B: Ah, "kitte" - you mean "stamp", right?! They sell stamps at the post office. A: "...Iie, kitte kudasai, kochira ni..."
B: Aha! You mean "please come"?! You wanna say "kite kudasai"! It's not unusual for exchanges like the one above to occur in conversations between Japanese-learners and native speakers. Pronunciation is probably one of the most difficult things to get to grips with when learning any foreign language. It seems there are lots of things you need to try in order to practise sounding more Japanese in your speech, like listening to lots of Japanese tapes, or creating an environment where you get to converse with native speakers. Here, in a series of articles covering aspects from 'entry level' to 'the basics' and 'practical application', we'll introduce some websites where you can practise your Japanese pronunciation, and where you can find some explanations and audio to help you. YYNIHONGO's 'Pronunciation Rules' bring together the absolute fundamentals and present them for you very simply. Illustrations and audio are also included, making them extra-easy to understand. 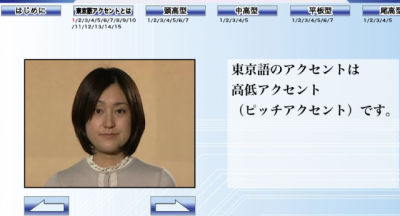 These contents are the perfect place to start tackling Japanese pronunciation. Tokyo Metropolitan University's mic-J website brings together key points regarding pronunciation extremely clearly in a section called 'Accent of Tokyo Japanese'. Compared with YYNIHONGO (above), which is very concise, this website explains things in a little more detail. The videos and explanations, which include scripts, are easy to understand, and examples are presented as you go along. Commentary is available in Japanese, Korean, Chinese and English. You'll find out key information about moras, syllables and accents in Japanese. 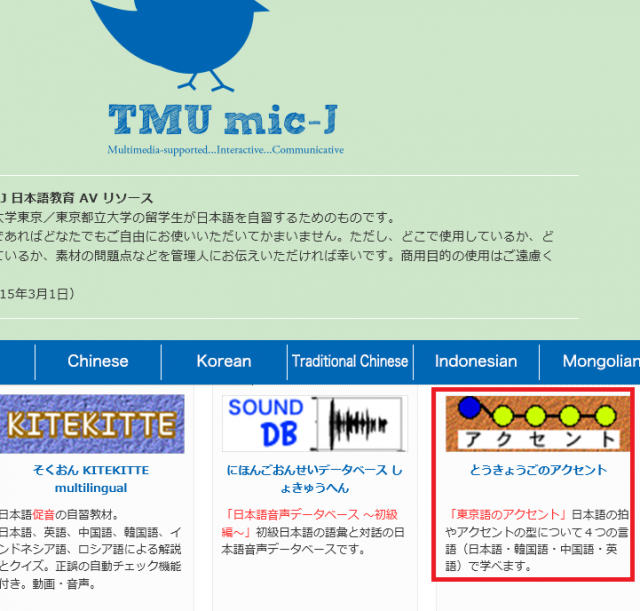 Using this site, you can practise 'sokuon' (assimilated sounds, i.e. the small 'tsu' in Japanese), seion (unvoiced sounds) and dakuon (voiced sounds) in particular. Here you can choose between Korean, Chinese and Indonesian for your language. You are shown videos of real situations for the purpose of introducing these practices, increasing the motivation for learning. This entry-level compilation will help you study the foundations of the Japanese pronunciation system. Those of you who find pronunciation to be a particular weakness, and therefore want to practise more, or those who want to study it in more detail, please see the other articles in our collection of sites for pronunciation - numbers (2) covering the basics and (3) which looks at practical application.